We are offering Cashew Candy Making Machine to our client. - Equipped with hot gas system, electrical defrosting system, and fan for cooling. Shri verai Engineering offering our clients with technically upgraded sweet Candy Making Machine. These offers products are fabricated by making use of supreme quality materials. We are manufacturer, exporter and supplier of all types confectionery machinery like candy making machine, toffee making machine, lolllipop making machine etc. 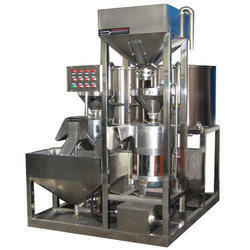 PRAGATI INDUSTRIES is the comany manufacturing All types Toffee machine. Our toffee machine have low maintenance. Our complete toffee machine include toffee cooker, cooling plate, batch roller, rope size, Toffee cut and wrapping machine etc. Jelly Candy Production Line inflatable gelatin soft candy(cotton candy)toffee candy automatically, The whole line consists of sugar-melting cooker, convey pump, storage forming machine. Air-conditioning, rolling sugar machine and so on. We are actively engaged in manufacturing an extensive range of Candy Making Machine for catering the diversified requirements of our clients. - Soundless Gearbox with hardened gears & grounded Shafts.